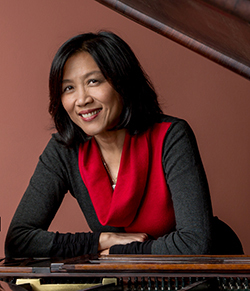 Next concert, June 1: At “Classical Contrasts,” the exceptional soloist Gwendolyn Mok will perform Beethoven’s Piano Concerto No. 4, perhaps his most intimate and poetic; it creates a unique dialogue between soloist and orchestra. The inventive, wacky, and wonderful music of Igor Stravinsky opens this evening of contrasting musical styles. Robert Schumann’s romantic Symphony No. 4 brings our season to a dramatic finish with a beautiful journey from darkness to light. Business support for LAS: This is a new project to raise funds for the Symphony. Please see details on the Supporting Businesses page. The initial supporting business people are Patti Smylie of ReMax Accord and Dean Simpson at Planet Home Lending. If you would like to become one of the LAS supporting businesses, please contact Dean. LASYO: Registration is due by May 1 for the Livermore-Amador Symphony Youth Orchestra. Symphony Notes: Read the April 2019 edition of Symphony Notes (635KB pdf), the newsletter published by the Symphony Guild. Estate sales managed by the Guild: Symphony Guild volunteers run estate sales professionally, with the Guild’s share of the proceeds donated to LAS. Find out more: If it’s time for an estate sale, contact the LAS Guild! Recent concerts: Hear the prelude talk (83MB mp3) and read the concert program booklet (1.3MB pdf) for “Dramatic Dvořák,” our April 13 concert. Read the concert program booklet (807K pdf) from “Colorful Characters”, our concert on February 23, and hear the prelude talk (70MB mp3). “Joy, Pathos, and Passion” began our formal concert season on December 1, 2018; read the concert program booklet (896K pdf). Also on December 1, LAS performed at a family concert presented by the Livermore Valley Performing Arts Center. “POPS: Bernstein on Broadway!” was the theme of the fundraiser Pops concert produced by the Symphony Guild on October 26. LAS accompanied B.J. Thomas at the Livermore Valley Performing Arts Center’s Brilliance at the Bankhead gala on September 8.